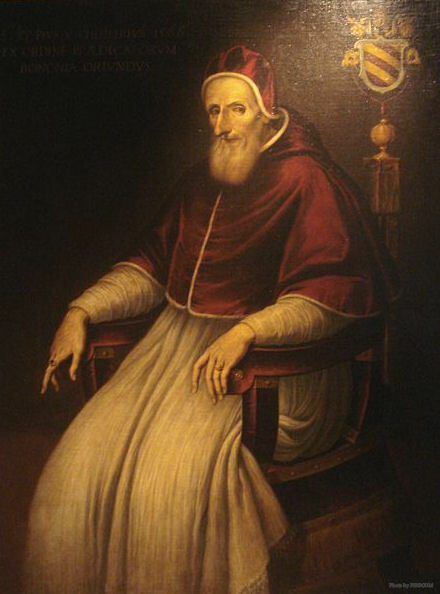 Born at Bosco, near Alexandria, Lombardy, 17 Jan., 1504 elected 7 Jan., 1566; died 1 May, 1572. 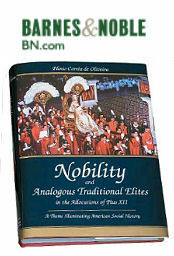 Being of a poor though noble family his lot would have been to follow a trade, but he was taken in by the Dominicans of Voghera, where he received a good education and was trained in the way of solid and austere piety. He entered the order, was ordained in 1528, and taught theology and philosophy for sixteen years. In the meantime he was master of novices and was on several occasions elected prior of different houses of his order in which he strove to develop the practice of the monastic virtues and spread the spirit of the holy founder. He himself was an example to all. He fasted, did penance, passed long hours of the night in meditation and prayer, traveled on foot without a cloak in deep silence, or only speaking to his companions of the things of God. In 1556 he was made Bishop of Sutri by Paul IV. 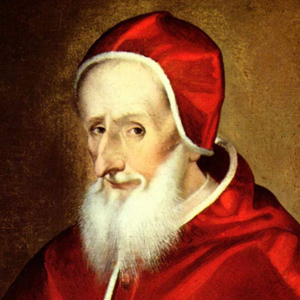 His zeal against heresy caused him to be selected as inquisitor of the faith in Milan and Lombardy, and in 1557 Paul IV made him a cardinal and named him inquisitor general for all Christendom. In 1559 he was transferred to Mondovi, where he restored the purity of faith and discipline, gravely impaired by the wars of Piedmont. Frequently called to Rome, he displayed his unflinching zeal in all the affairs on which he was consulted. Thus he offered an insurmountable opposition to Pius IV when the latter wished to admit Ferdinand de’ Medici, then only thirteen years old, into the Sacred College. 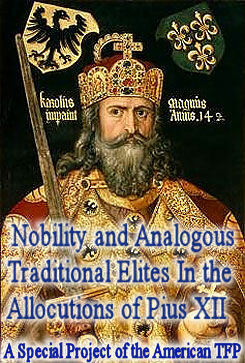 Again it was he who defeated the project of Maximilian II, Emperor of Germany, to abolish ecclesiastical celibacy. 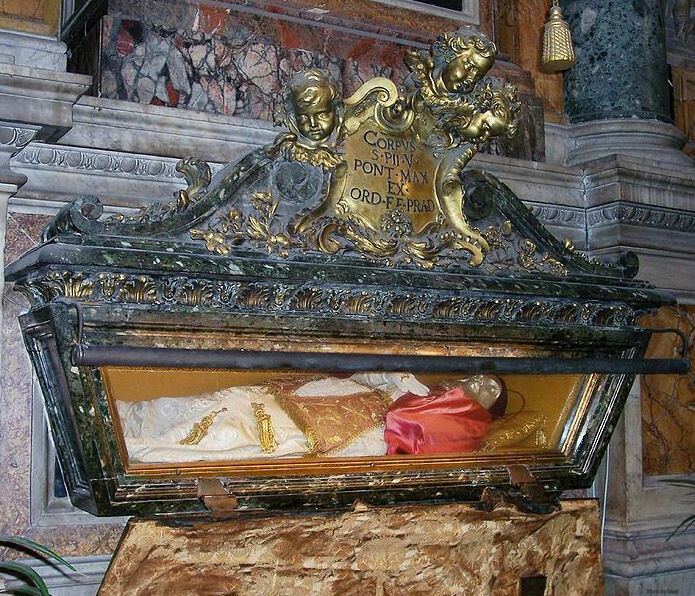 On the death of Pius IV, he was, despite his tears and entreaties, elected pope, to the great joy of the whole Church. He began his pontificate by giving large alms to the poor, instead of distributing his bounty at haphazard like his predecessors. 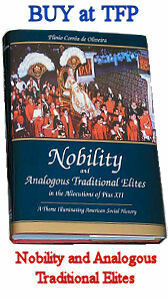 As pontiff he practiced the virtues he had displayed as a monk and a bishop. His piety was not diminished, and, in spite of the heavy labours and anxieties of his office, he made at least two meditations a day on bended knees in presence of the Blessed Sacrament. In his charity he visited the hospitals, and sat by the bedside of the sick, consoling them and preparing them to die. He washed the feet of the poor, and embraced the lepers. It is related that an English nobleman was converted on seeing him kiss the feet of a beggar covered with ulcers. He was very austere and banished luxury from his court, raised the standard of morality, laboured with his intimate friend, St. Charles Borromeo, to reform the clergy, obliged his bishops to reside in their dioceses, and the cardinals to lead lives of simplicity and piety. 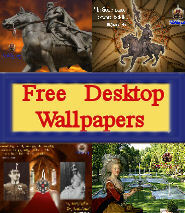 He diminished public scandals by relegating prostitutes to distant quarters, and he forbade bull fights. He enforced the observance of the discipline of the Council of Trent, reformed the Cistercians, and supported the missions of the New World. 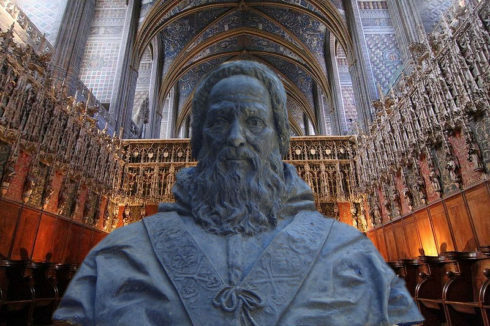 In the Bull “In Coena Domini” he proclaimed the traditional principles of the Roman Church and the supremacy of the Holy See over the civil power. But the great thought and the constant preoccupation of his pontificate seems to have been the struggle against the Protestants and the Turks. In Germany he supported the Catholics oppressed by the heretical princes. In France he encouraged the League by his counsels and with pecuniary aid. In the Low Countries he supported Spain. In England, finally, he excommunicated Elizabeth, embraced the cause of Mary Stuart, and wrote to console her in prison. In the ardour of his faith he did not hesitate to display severity against the dissidents when necessary, and to give a new impulse to the activity of the Inquisition, for which he has been blamed by certain historians who have exaggerated his conduct. Despite all representations on his behalf he condemned the writings of Baius (q.v. ), who ended by submitting. He worked incessantly to unite the Christian princes against the hereditary enemy, the Turks. In the first year of his pontificate he had ordered a solemn jubilee, exhorting the faithful to penance and almsgiving to obtain the victory from God. He supported the Knights of Malta, sent money for the fortification of the free towns of Italy, furnished monthly contributions to the Christians of Hungary, and endeavoured especially to bring Maximilian, Philip II, and Charles I together for the defence of Christendom. In 1567 for the same purpose he collected from all convents one-tenth of their revenues. 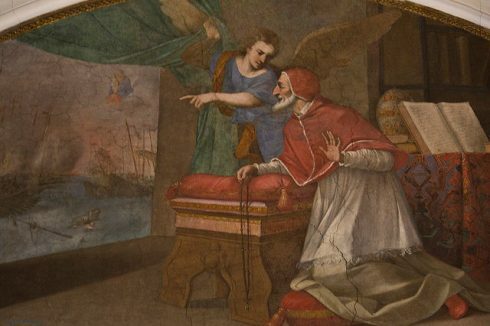 Pope St Pius V sees the Victory at Lepanto. This fresco is in the cell of St Pius V in Santa Sabina, Rome. In 1570 when Solyman II attacked Cyprus, threatening all Christianity in the West, he never rested till he united the forces of Venice, Spain, and the Holy See. He sent his blessing to Don John of Austria, the commander-in-chief of the expedition, recommending him to leave behind all soldiers of evil life, and promising him the victory if he did so. He ordered public prayers, and increased his own supplications to heaven. 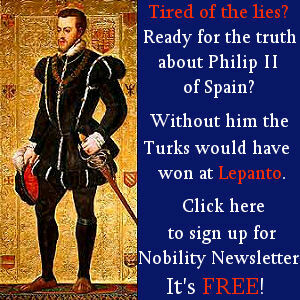 On the day of the Battle of Lepanto, 7 Oct., 1571, he was working with the cardinals, when, suddenly, interrupting his work opening the window and looking at the sky, he cried out, “A truce to business; our great task at present is to thank God for the victory which He has just given the Christian army”. He burst into tears when he heard of the victory, which dealt the Turkish power a blow from which it never recovered. In memory of this triumph he instituted for the first Sunday of October the feast of the Rosary, and added to the Litany of Loreto the supplication “Help of Christians”. He was hoping to put an end to the power of Islam by forming a general alliance of the Italian cities Poland, France, and all Christian Europe, and had begun negotiations for this purpose when he died of gravel, repeating “O Lord, increase my sufferings and my patience!” He left the memory of a rare virtue and an unfailing and inflexible integrity. He was beatified by Clement X in 1672, and canonized by Clement XI in 1712. The tomb of Pope Pius V in Santa Maria Maggiore. MENDHAM, Life and Pontificate of St. Pius V (London, 1832 and 1835); Acta SS., I May; TOURON, Hommes illustres de l’ordre de St.-Dominique, IV; FALLOUX, Histoire de S. Pie V (Paris, 1853); PASTOR, Gesch. der Papste, ARTAUD DE MONTOR, History of the Popes (New York, 1867); Pope Pius V, the Father of Christendom in Dublin Review, LIX (London, 1866), 273.